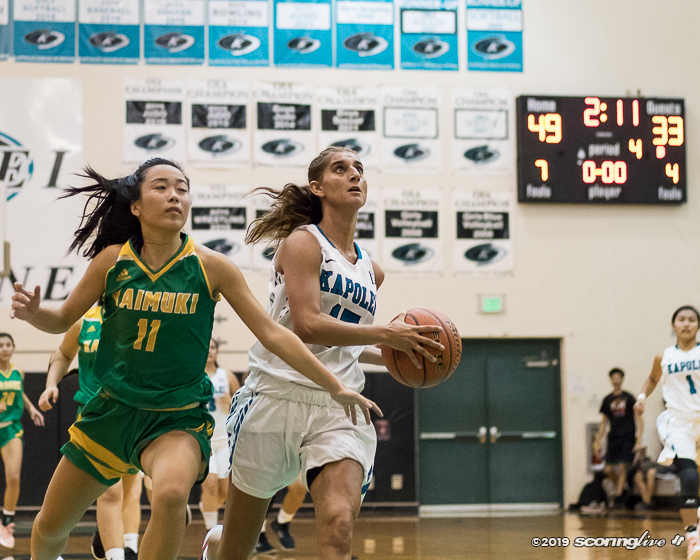 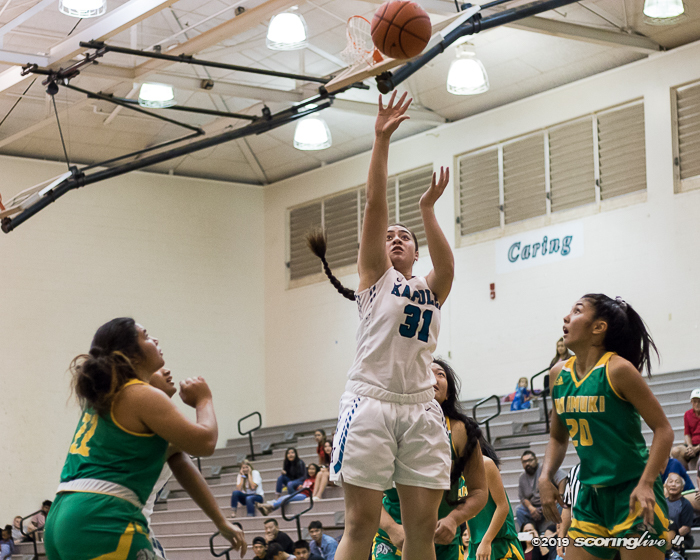 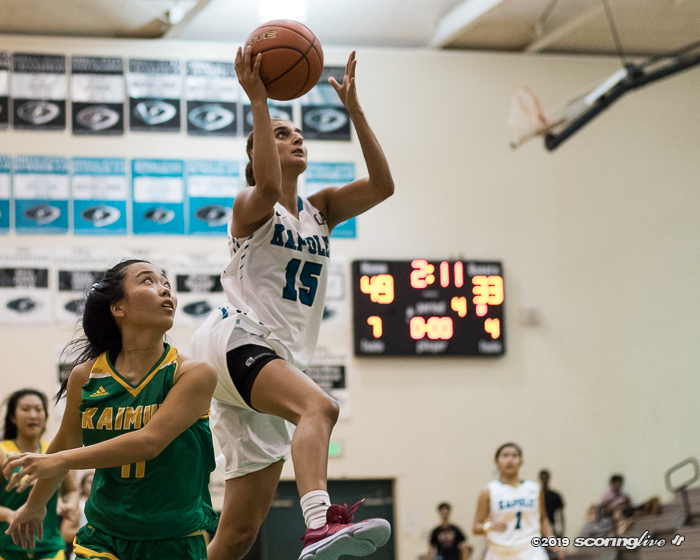 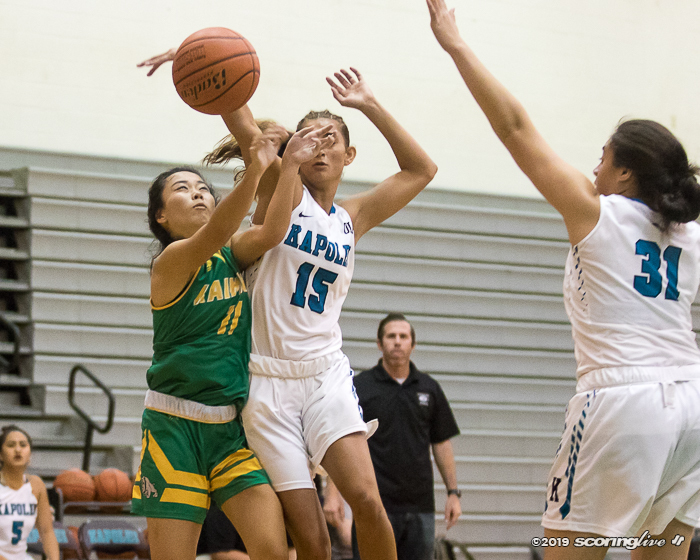 KAPOLEI — Hadassah "Lasi" Tuiolemotu did not play in the Kapolei girls basketball team's 46-31 preseason loss to Kaimuki last November. 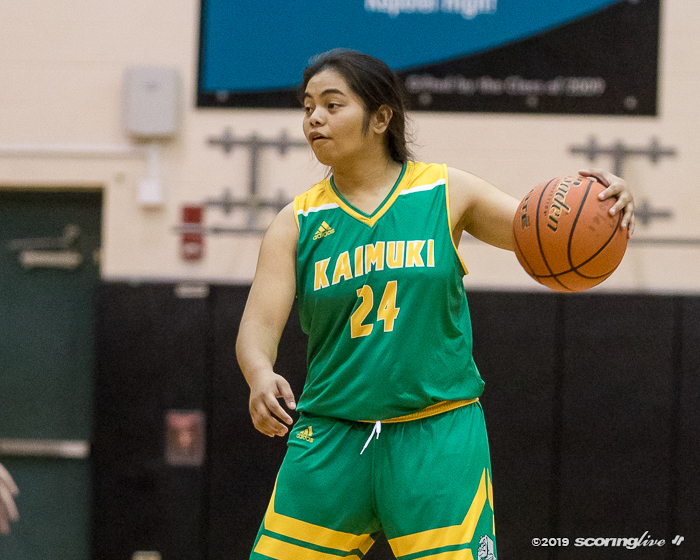 On Wednesday night, she was the star of the show in the Hurricanes' 54-36 playoff win over the visiting Bulldogs. 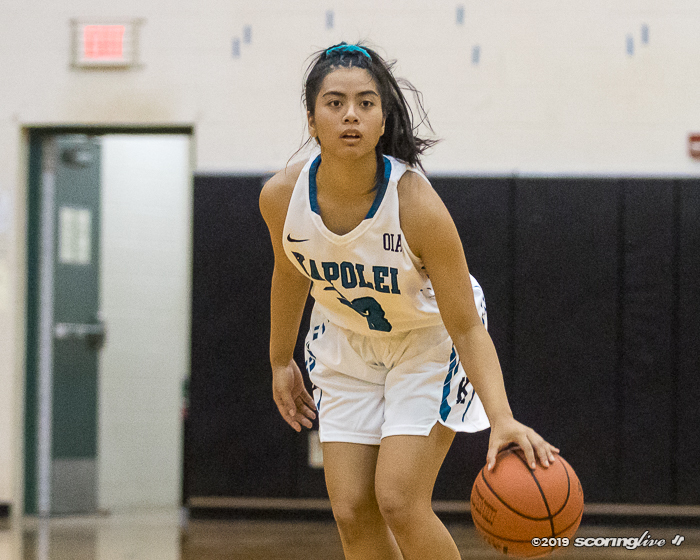 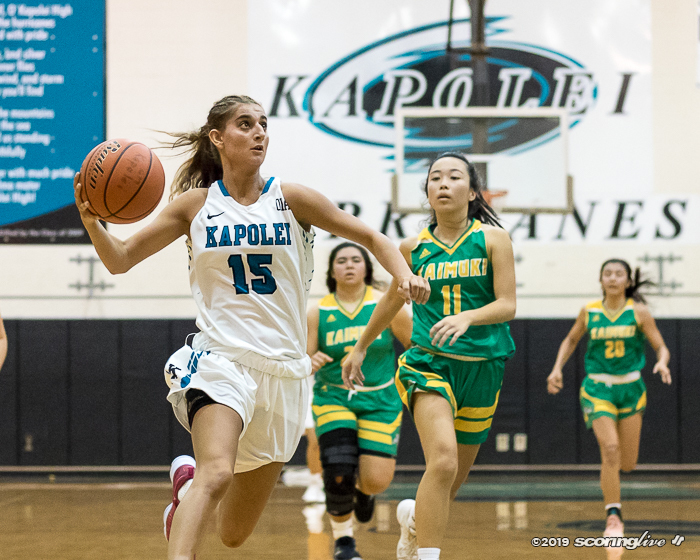 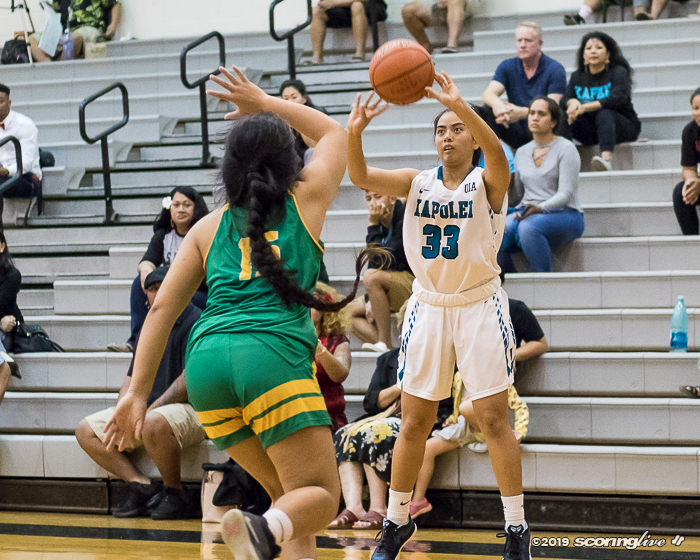 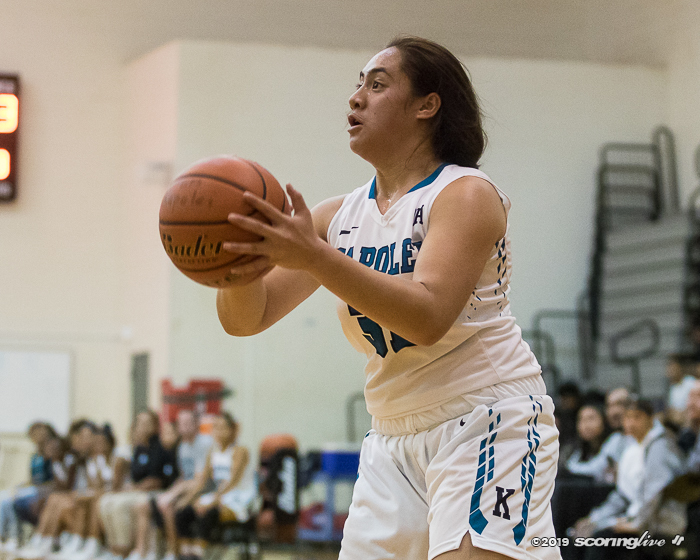 The Kapolei sophomore scored a career-high 26 points with 13 rebounds to help the Hurricanes (10-7 overall, 7-4 OIA) storm past Kaimuki in the opening round of the OIA Division I playoffs. 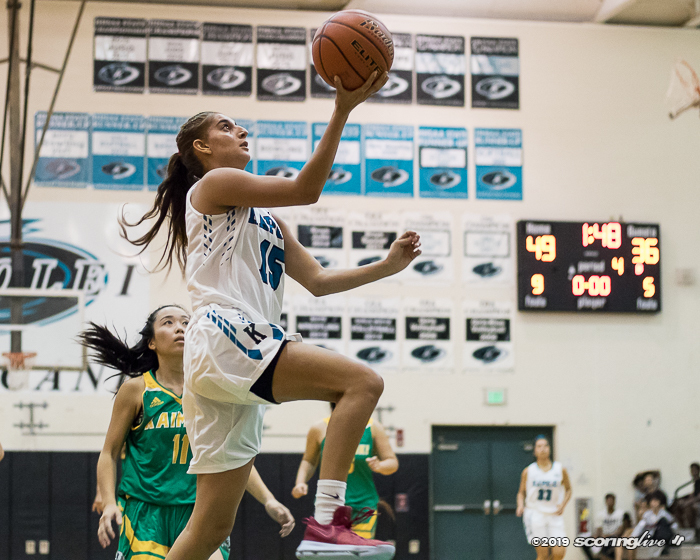 She also added four steals, three blocks and two assists for good measure. 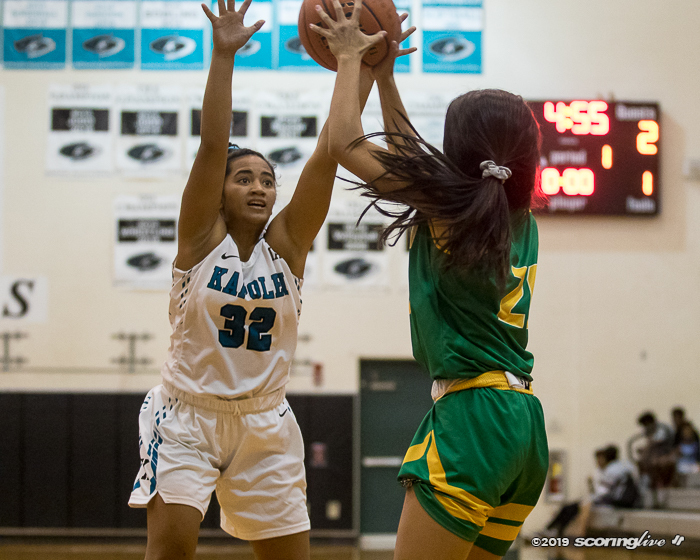 "She played really big for us," Kapolei coach James Aronica said of Tuiolemotu. 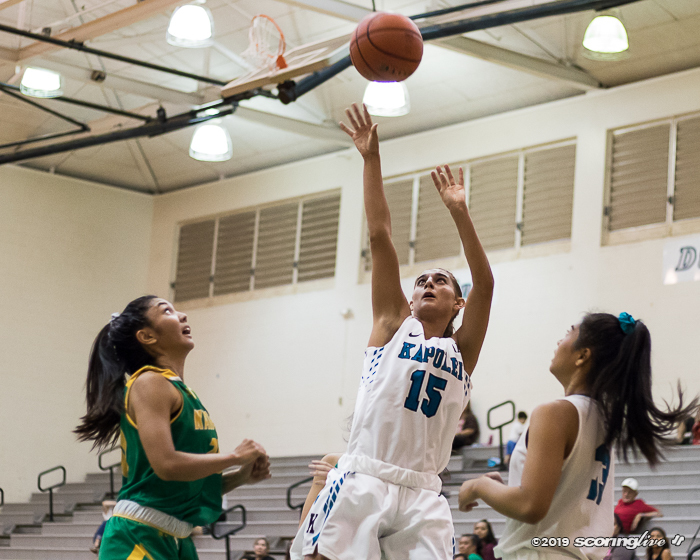 "She stepped up and on top of that, she's a great student with a 4.0 GPA. 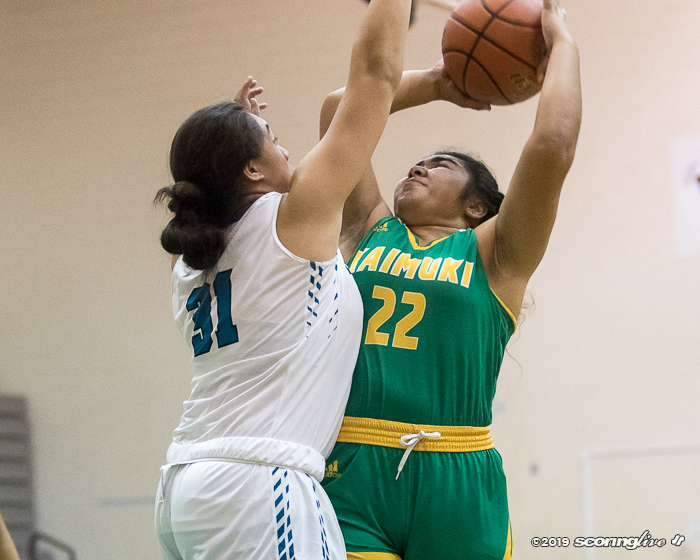 It shows in the classroom and it showed on the court tonight." 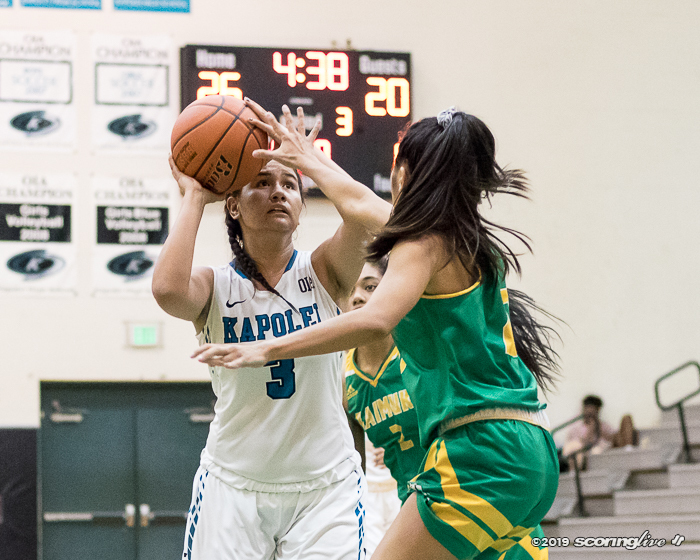 Kapolei, the fourth-seeded team from the West, will travel to take on the East No. 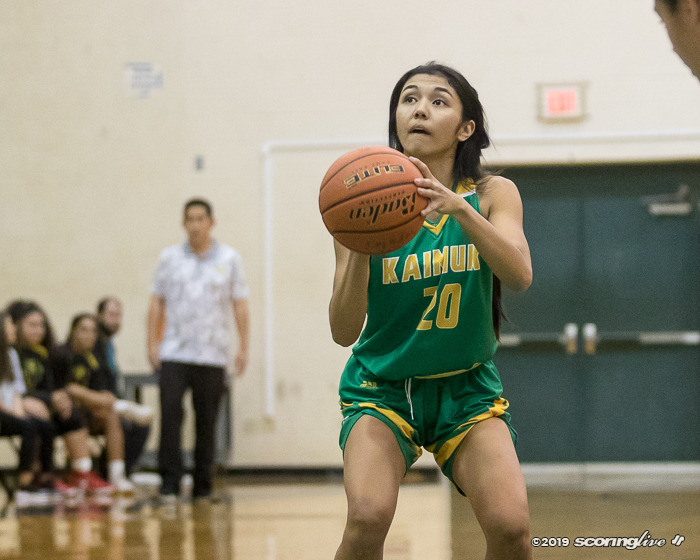 1 seed Kahuku Thursday night at 6:00 p.m. 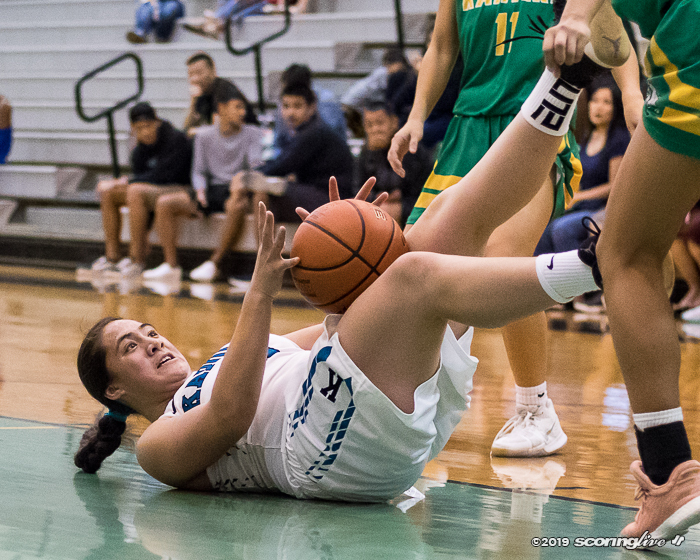 The Bulldogs suffered their second straight season-ending loss in the opening round of the playoffs and finished with a 12-11 and 6-5 record. 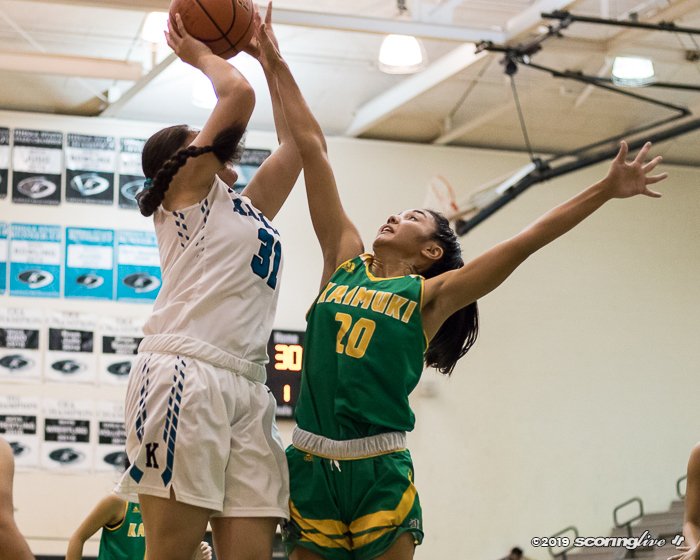 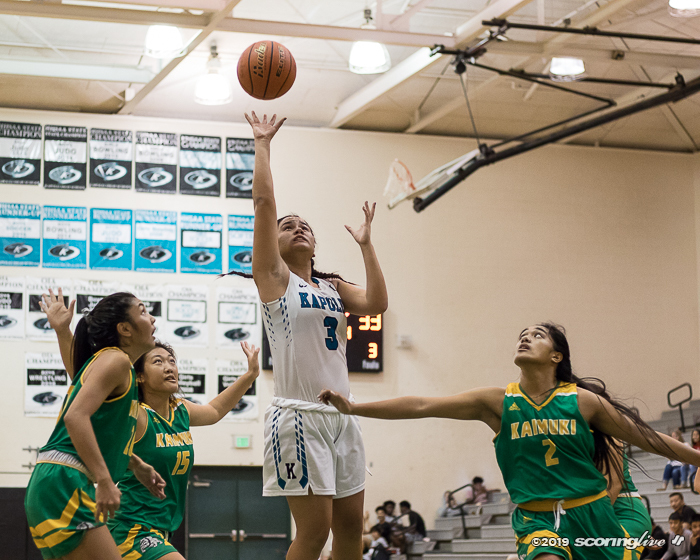 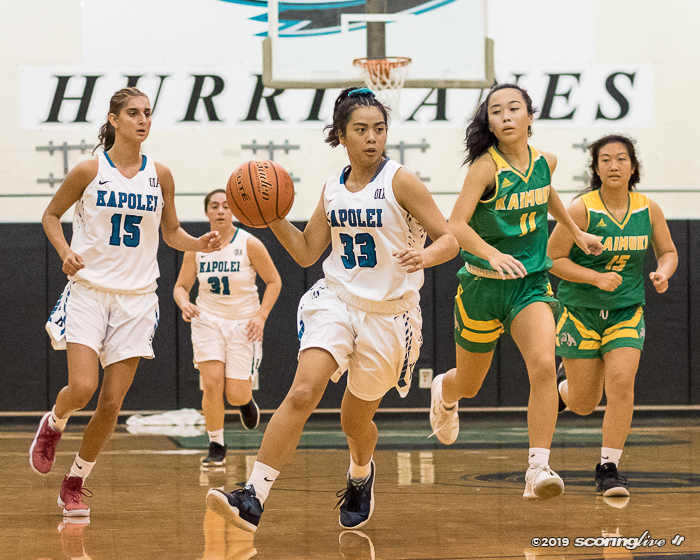 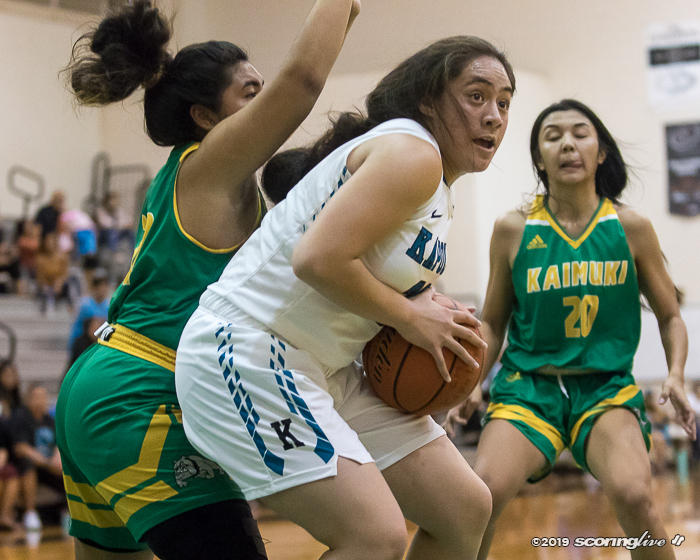 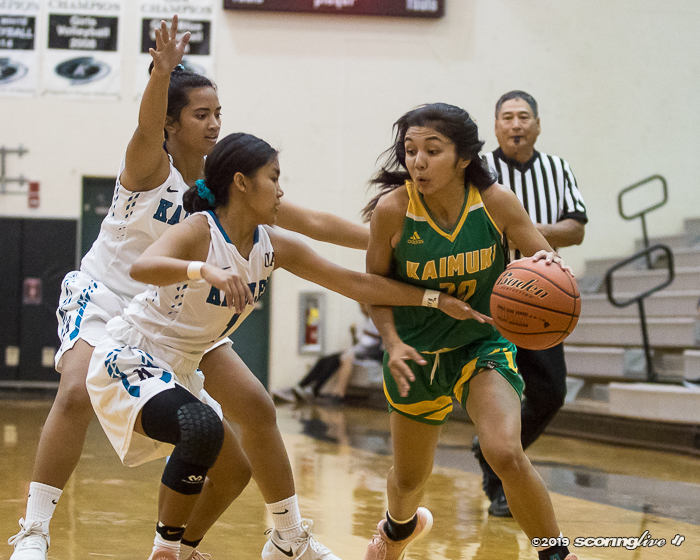 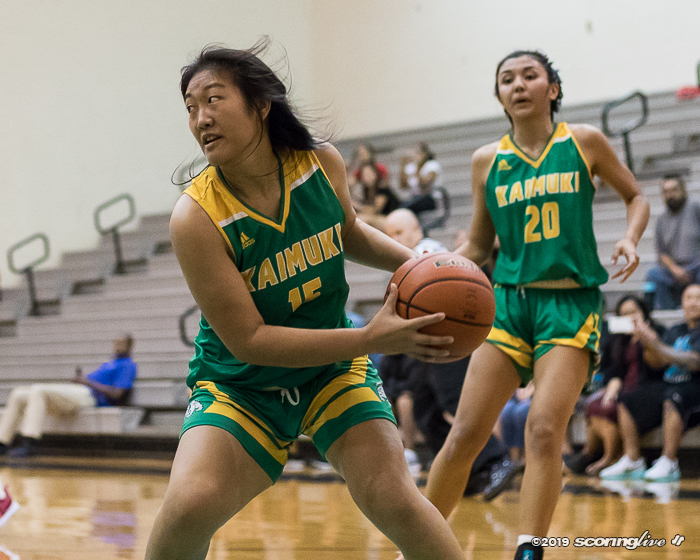 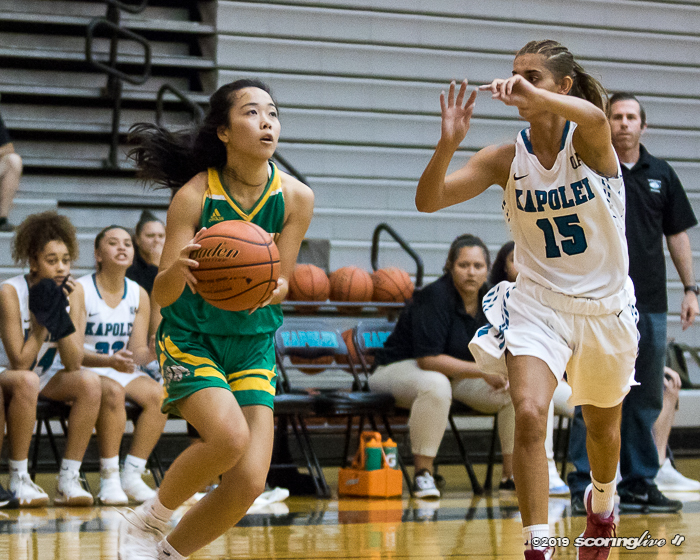 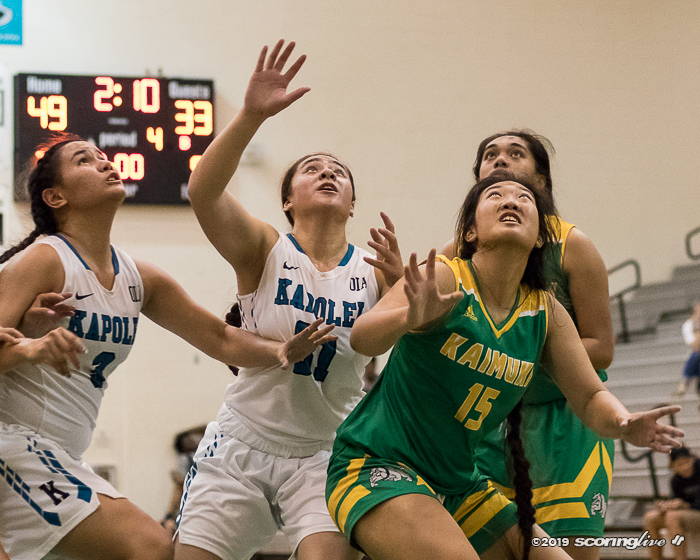 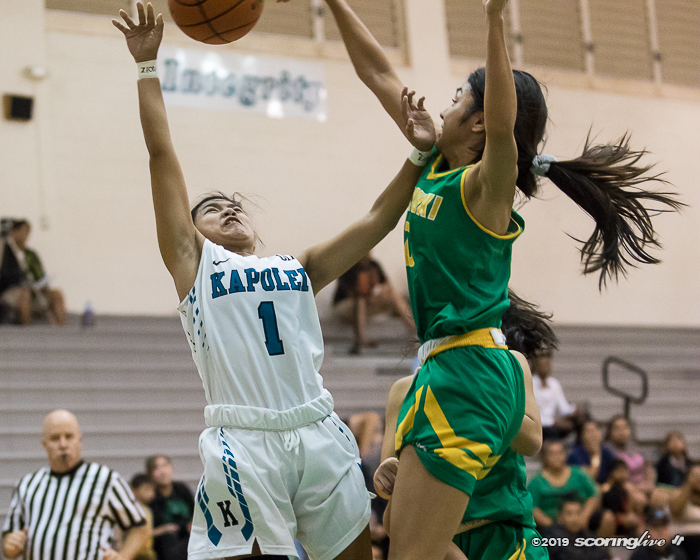 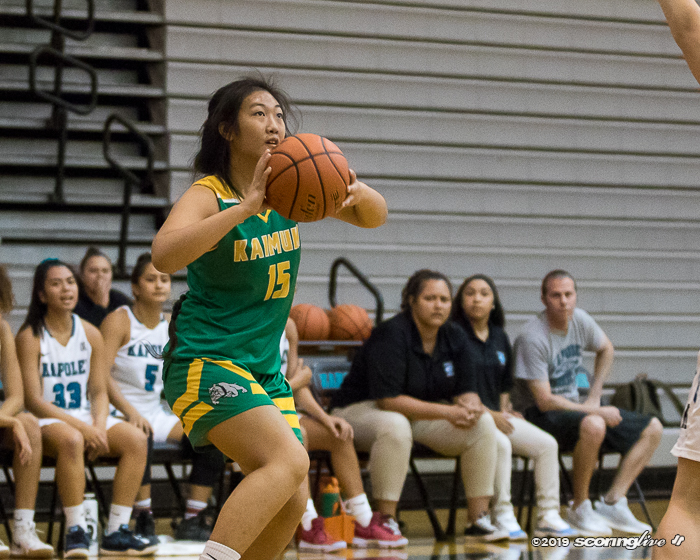 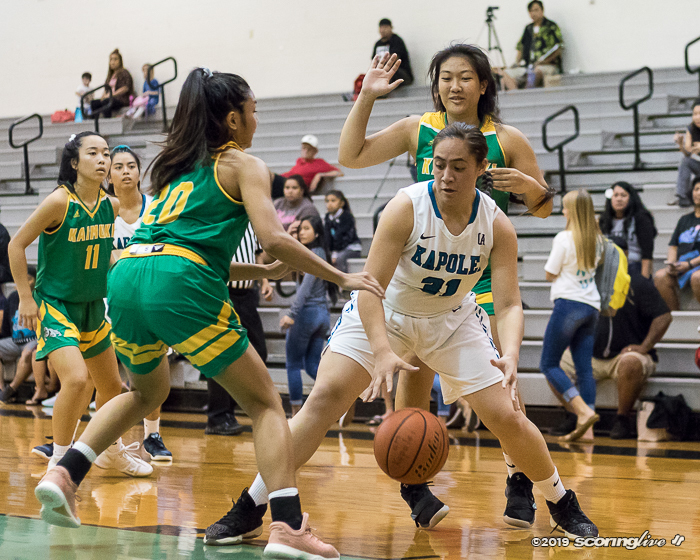 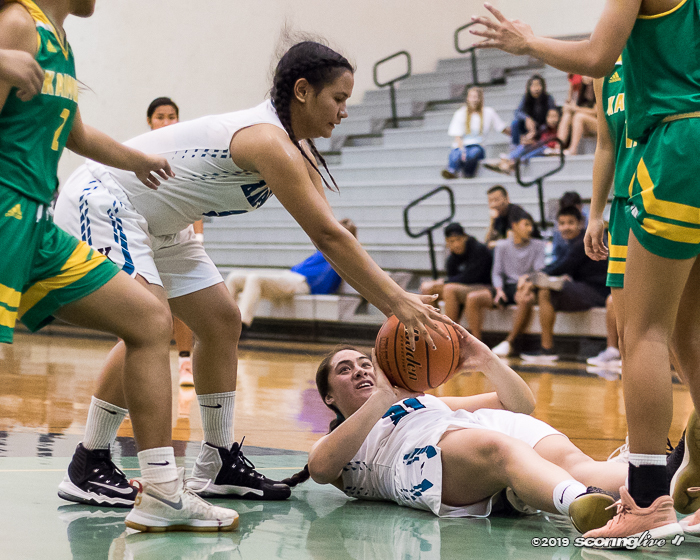 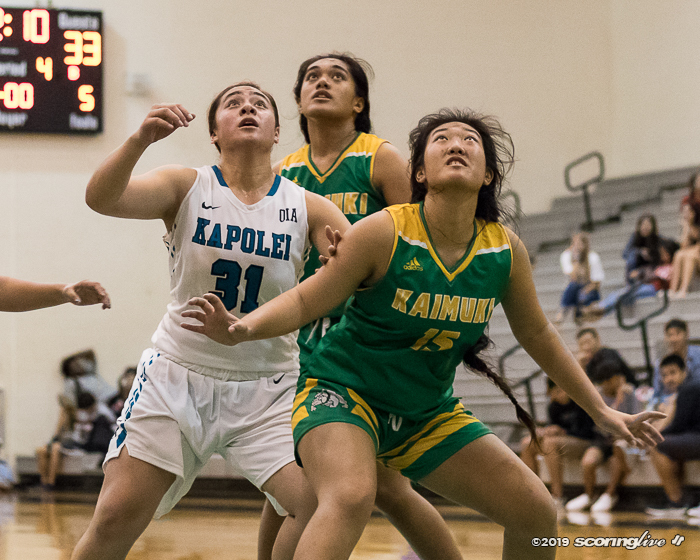 The Hurricanes trailed 10-7 after the first quarter before changing up their defense in the second period to take a 26-18 lead at the half as Kaimuki committed 10 of its 22 turnovers in the second quarter. 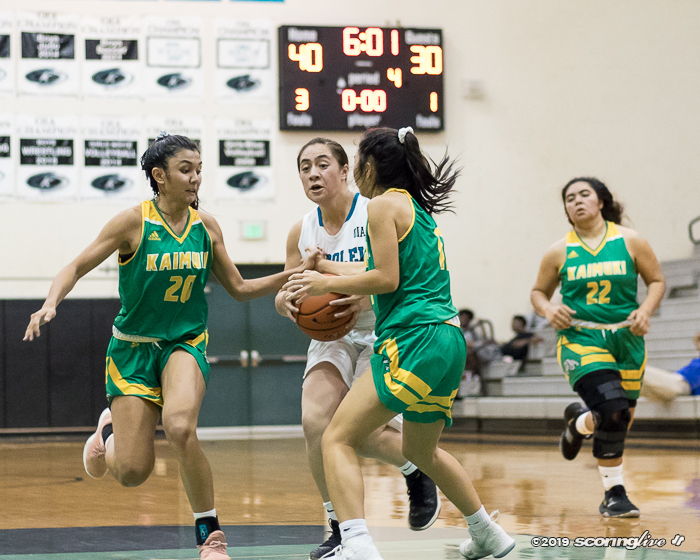 Aronica said his team switched to a box-and-one defense to slow down Kaimuki senior Kaelyn Espinda, who scored 25 points in the preseason matchup. 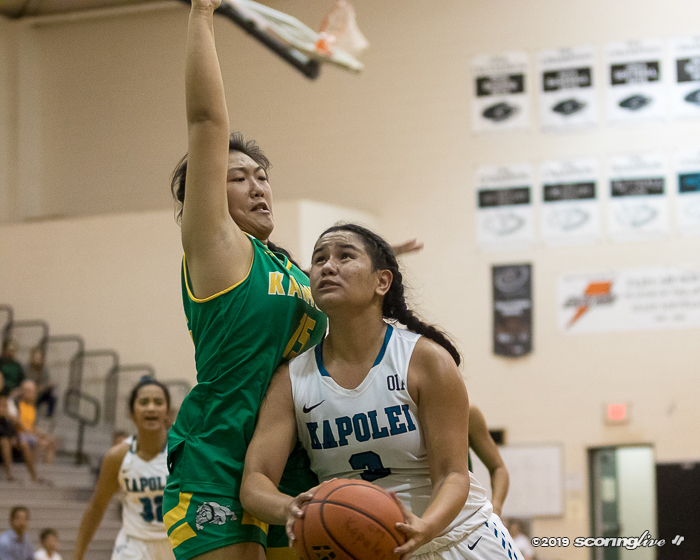 Espinda still finished with 23 points and added a game-high 14 rebounds, but had to fight for every point just to seep Kaimuki in the game. 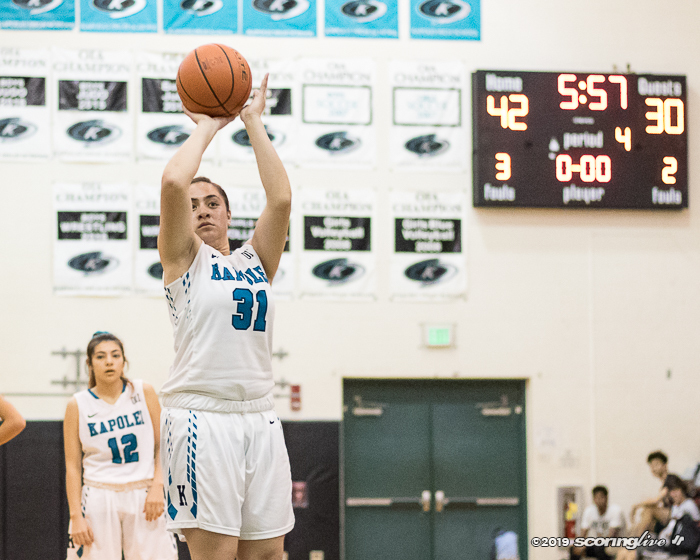 "In the first half I wanted to kind of feel it out," said Aronica. 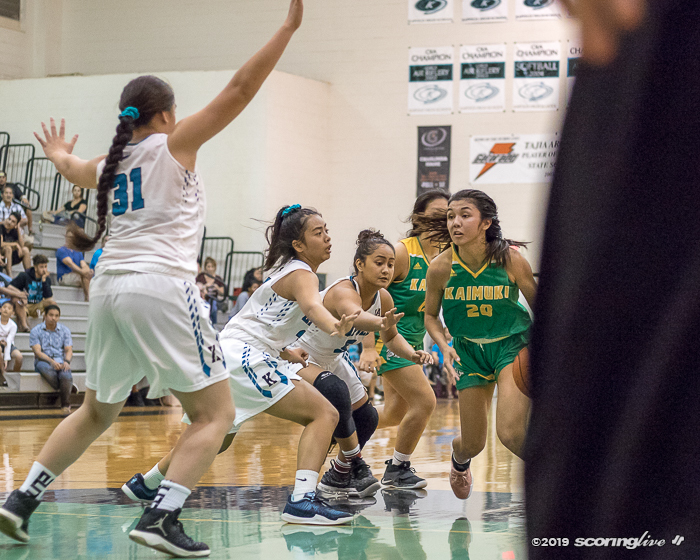 "Once we made the adjustment, I think it worked out really well. 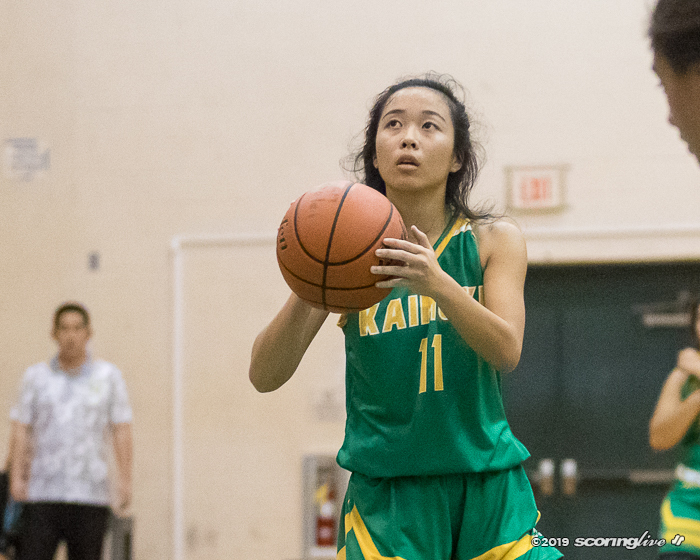 We were able to build a little bit of a lead and keep the lead." 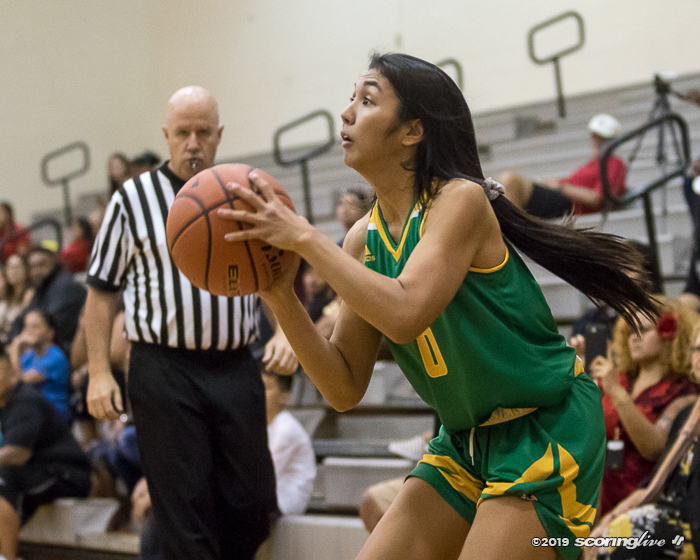 Julia Velasco added nine points and five assists and Analisa Mimi Liotta had nine points and seven boards off the bench for the Hurricanes. 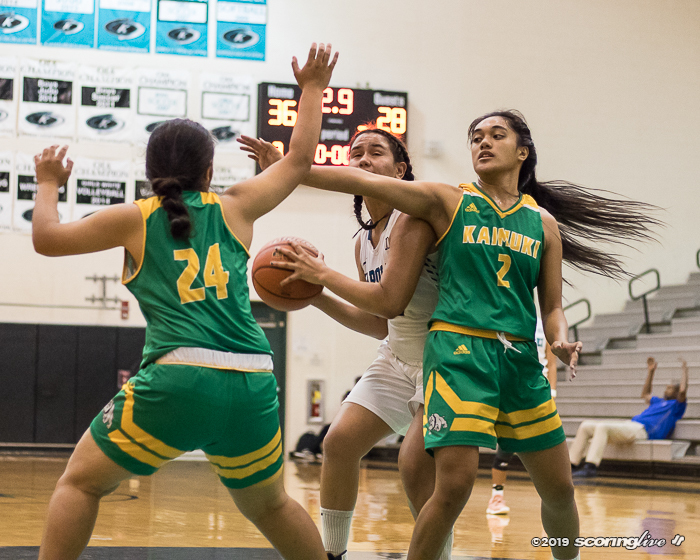 Sienna Alo chipped in six points with four rebounds and four steals and Ayanna Nunuha did a little bit of everything with three points, three rebounds, three assists and three steals. 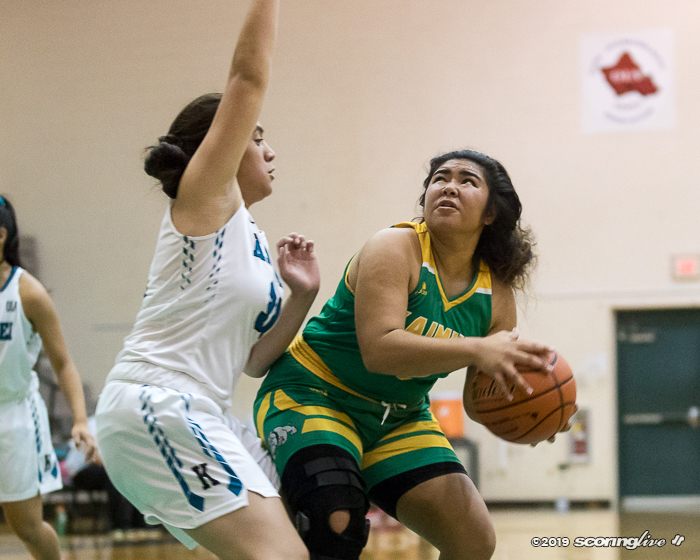 "Everyone that went into the game stepped up," said Aronica. 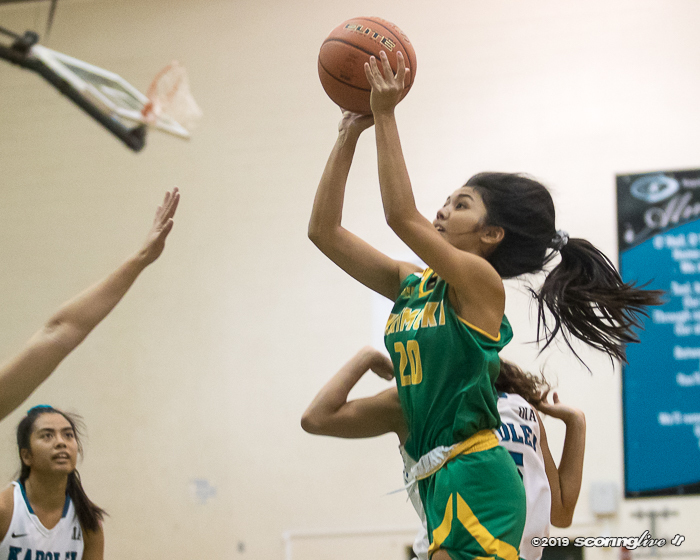 "I'm really proud of the whole team for that. 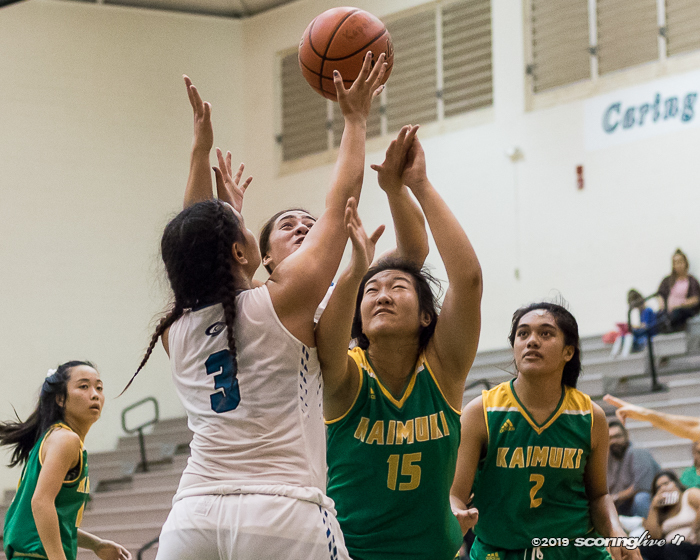 It was a team win."